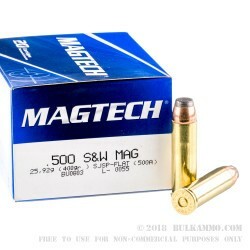 This Magtech Ammunition revolver ammo is loaded with their 400 grain, lead core, Semi-Jacketed soft point bullets for maximum expansion upon impact, deep penetration, and consistent terminal effects. 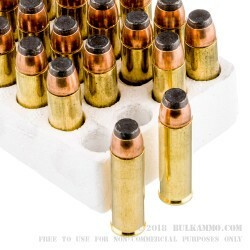 These massive .500 Smith and Wesson revolver bullets are loaded into heavy duty, reloadable, thick walled, non-corrosive Boxer primed, new brass cases. They have a high-speed muzzle velocity of 1608-feet per second, and a dramatic muzzle energy of 2297-foot pounds. 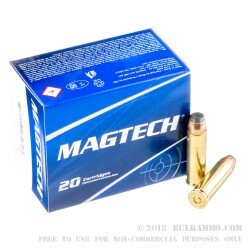 They are packed up in Magtech’s recognizable blue 20 round boxes and are ready to go whenever you are. Get yours today so your next trip the range is a fun one. 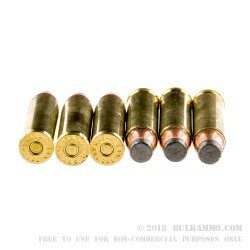 The "500 Smith" or .500 Smith and Wesson Magnum was designed and developed in 2003 for the massive S&W X-Frame Revolver. Smith and Wesson and Cor-Bon teamed up and put their skill sets to the test to create this legendary wheel-gun load. They designed the round to hold the record for the most powerful production revolver round in existence. While Cor-bon was busy bringing the round to life, the Smith and Wesson team designed and built the huge X-Frame handgun to shoot the big .500 S&W Magnum load. Since that time, the popularity of the .500 S&W Magnum has grown by leaps and bounds and is still one of Americas largest handgun loads in production.